Author J.R.R. Tolkien once referred to his mammoth and sprawling The Lord of the Rings series as being "unfilmable," but that statement was obviously made decades ago, long before technology and writer/director Peter Jackson got a hold of the project. Jackson's equally mammoth and sprawling film trilogy is simply epic on every scale, creating a believable and tactile Middle-Earth while carefully morphing and compressing Tolkien's story into a manageable package that would not only please the legions of Rings fans, but make for marketable movie entertainment for regular joes. Thankfully, Jackson seems to have tilted the scales in favor of Tolkienites, creating his own fairly faithful version of the story, an intricately written trilogy that doesn't pander to audiences. 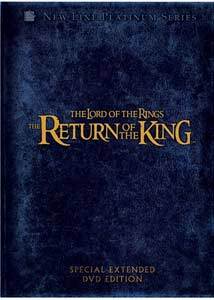 With the release of this four-disc extended edition, as was done with The Fellowship of the Ring and The Two Towers, Jackson has once again been given the opportunity to reinstate scenes (14 new and 22 extended) back into The Return of The King that were not part of the original theatrical run. In this case it's just over fifty minutes of footage, melded seamlessly into the finished product, which expands the runtime well past the four-hour mark. There is no "previously on The Lord of the Rings" primer at the beginning, just as there wasn't in The Two Towers, though Jackson does go backwards just a bit by opening The Return of the King with a flashback sequence showing the origin/transformation of hobbit Smeagol (Andy Serkis) into duplicitous Gollum after being eternally corrupted and controlled by the power of the One Ring. From then on, it picks up where The Two Towers left off, and the evil goes into the red and the battles become even more grandly violent and expansive. I get chills everytime I watch the Battle of Pelennor Fields sequence, from the heroic arrival of Theoden (Bernard Hill) and the Rohirrim to their weary face-off against an onslaught of Haradrim and mumakil. There are five separate stories going on at once in this final chapter—spread across the breadth of magical Middle-Earth—all building and interconnecting with sweeping high drama and spectacular action sequences, and if you haven't seen the first two films you're going to be hopelessly lost. The One Ring is on the final leg of its journey, and must be destroyed in the fires of Mount Doom by Frodo (Elijah Wood), with no help from bug-eyed Gollum (Serkis), despite the adoring faithfulness of fellow hobbit Samwise (Sean Astin). Aragorn (Viggo Mortensen), the rightful heir to the throne of Gondor, must make his way on his own treacherous journey, eventually leading to Mordor, accompanied by elf Legolas (Orlando Bloom) and dwarf Gimli (John Rhys-Davies), while the other members of the original fellowship—Gandalf (Ian McKellen), Pippin (Billy Boyd), and Merry (Dominic Monaghan)—find their destinies just as intertwined as the ever-expanding reach of Mordor stretches across Middle-Earth. One of the pivotal new additions, in my estimation, to this extended edition is the inclusion of the fate of the wizard Saruman (Christopher Lee), occurring at the Ent-damaged remains of the Tower of Isengard. A lot of Tolkienites bristled that this didn't make the theatrical cut—and it does seem odd that it didn't, considering Saruman's role in The Two Towers—but it is here, finally, and it serves as a necessary bit of closure that just wasn't there before. Other new action scenes, such as our first view of the Army of the Dead in action against a sailing ship of lusty Corsairs on their way to Gondor and an encounter between Aragorn and the Mouth of Sauron (Bruce Spence) are balanced against sweet moments such as the one between Eowyn (Miranda Otto) and Faramir (David Wenham), and a brief backstory on the origins of Pippin's Gondorian livery that serves to indelibly connect him with another character. From a technical standpoint, The Return of the King represents the current high bar for visual effects, and the scale and scope of the battle scenes—such as the now extended Battle of Pelennor Fields sequence, featuring those gigantic elephant-like mumakil—is a stunning achievement. (Go ahead, just try and convince me those lumbering mumakils aren't real.) Jackson and his highly skilled team have done what Tolkien (and likely many Rings fans) long thought impossible, which was to successfully and accurately (within reason) bring to the screen a vision of Middle-Earth that was true to the source material. Purists and their unforgiving nature aside, does it matter that the extended edition features Eowyn uttering lines originally spoken by Faramir in the book? Not really. Necessary changes, compressions, morphs, and omissions notwithstanding, Jackson's extended edition of The Return of the King is as close to perfect as one could realistically expect, and by combining all three extended versions there is nearly 11 hours of story to enjoy. Image Transfer Review: As with the earlier two-disc release, New Line has issued this version of The Return of the King in a smart-looking 2.35:1 anamorphic widescreen transfer. Vivid colors and deep, well-rendered shadows contribute to a level of image quality that reveals particularly strong amounts of detail. Not a physical blemish to be found here, and compression issues are absolutely minimal. Audio Transfer Review: New Line one-ups the previous two-disc version by adding a DTS ES 6.1 surround track, in addition to the Dolby Digital EX 5.1 surround mix. Both of these are aggressive, booming, and above all very, very loud. The soundstage for both is properly expansive, designed to be sweeping and thundering at the same time, delivering one of the deepest sub tracks I've come across. Battle sequences are bold and bone-rattling (witness the resonance of the wolf's-head Grond battering ram as the doors of Gondor come down), while softer sequences (the gentle moments between Aragorn and Arwen) paint the dialogue cleanly, and Howard Shore's stirring score builds with intensity in all the right spots. An understandably meek-by-comparison 2.0 surround track is also included. It all starts off with a staggering four commentaries consisting of 40 different participants. Do the math (commentaries x runtime) and you have a whopping 16+ hours of commentary, which is an almost imposing amount of background. For me, the three technical tracks seem to be the best, offering the deepest, meatiest info, ranging from writing struggles to the creation of certain effects shots, but even one track is a lot to sit through in one chunk. The cast track in comparison is lighter in tone overall, and in addition to just about every principal player, also includes Serkis in character as both Smeagol and Gollum. On the director track, Jackson proves himself appropriately chatty and relaxed, and the content often centers on the logistics of chronologies and timelines. There is not a lot of downtime, which on a film of this length is dizzying in its own right. One of the typical drawbacks of a crowded commentary is keeping track of who's talking, but here each participant's name/title is flashed on the screen whenever they speak, so it is a little easier to keep track of who's saying what. Just about every individual shows up at some point on the Discs 3 and 4 supplements, so if you watch those first it's handy to have a face to put to the names, especially for the production and design teams. There is a brief Introduction (01m:33s) from the affable Peter Jackson where he explains the general structure of the appendices, and ruminates on the closure of the whole LOTR saga. In this look at the life of Tolkien, more specifically his creation of Middle-Earth, a series of knowledgeable scholarly types offer insight and parallels between the writer's life and his epic mythology. There are comments from Tolkien biographers (Tom Shippey, John Garth, Colin Duriez, Dr. Patrick Curry), his publisher (Rayner Unwin), a couple of Tolkien linguists (Bill Welden, David Salo), conceptual designer John Howe, LOTR screenwriter Philippa Boyens, LOTR "making-of" author Brian Sibley, The Visual Companions author Jude Fisher and even a few whispered words from the king himself, Viggo Mortensen. Explanations of Tolkien's language development, such as using Finnish as the basis for the first Elvish language (Quenya), or using Welsh as the roots of the Sindarin tongue. Listening to these individuals all commenting on the mythos of Middle-Earth as if it were real, citing key battles and the like, reassures me I'm not alone in my Tolkien nerdiness. For purists, screenwriter Boyens even addresses the need for shifting a passage of key book dialogue from Faramir to Eowyn for the film. The necessary and controversial aspect of merging/editing/changing/combining/compressing elements of Tolkien's book versus the finished films is the subject here, and for my money could have easily been twice as long. Using a combination of test footage, behind-the-scenes material, and finished sequences, this segment also features interview/comments from Tom Shippey, Brian Sibley, Jude Fisher, Philippa Boyens, Peter Jackson, John Rhys-Davies, Christopher Lee, Elijah Wood, Billy Boyd, Andy Serkis, Viggo Mortensen, and Mark Ordesky (executive producer). There's much talk of the chronology and event timelines (such as the proper placement of the Stairs of Cirith Ungol/Siege of Gondor sequences), as well as some footage of Aragorn battling a positively towering Sauron at The Black Gate. Elijah Wood gets off a rather funny Jack Nicholson story having to do with his complaints about the film having "too many endings." This mixture of animatics/storyboards, with music and bits of dialogue, shows the original concept for a battle between Aragorn and Sauron that was eventually scrapped, intercut with storyboard art for Frodo and Gollum at the Crack of Doom. In the final version, Sauron was replaced by a troll, and some of the filmed footage is shown in the Forging the Final Chapter segment. The discussion here is what is referred to as the "evolutionary process" of the look of film, with input from Jackson, Dan Hennah (supervising art director), Chris Hennah (art department manager), John Howe (conceptual designer), Rick Porras (co-producer), Grant Major (production designer), and Shane Rangi (stunt performer), as well as a few key cast members like Wood, Sean Astin, Orlando Bloom, and Ian McKellan. Much like the discussion of adapting the book to film, the physical creation/design/influences of the structures and set is an equally fascinating subject, and content here ranges from the selection of New Zealand to spontaneously combusting sets to finding the right material for Shelob's web. And those of you who recognized locales from Jackson's Braindead will be rewarded with comparison shots. The extensive utilization of detailed miniatures is the subject for this segment, with principal input from Jackson, John Howe (conceptual designer), Barrie Osbourne (producer), Alan Funke (visual effect D.P. ), Alan Lee (conceptual designer), Richard Taylor (Weta creative supervisor), Peter Lyon (Weta swordsmith), and Paul Van Ommen (head model technician). Up close behind-the-scenes footage on the creation of Minis Tirth, Minis Morgul, the Tower of Cirith Ungol, the City of the Dead, the Grey Havens, and even a piece on the Grond, the massive wolf's-head battering ram, are included. Fascinating stuff, with oddball highlights of Elijah calmly discussing an effects shot while encased in Shelob's webs and mountains of tiny skulls (used in the Cave of the Dead sequence) being swept up by the production crew. Forty minutes isn't nearly enough to give the proper due to the Weta Workshop crew for their work on the trilogy, but this segment does manage to cram a lot in. Subjects include the development of the armor and weapons used by the various races, built around their specific cultural backstory, with special attention given to Gondor, the Haradrim, Orcs, the Witch King, the Mouth of Sauron, the Army of the Dead, Shelob, and the lumbering mumakils. Primary comments come from Peter Jackson, Richard Taylor (Weta creative supervisor), Tania Rodger (Weta Workshop manager), John Howe (conceptual designer), Alan Lee (conceptual designer), Matt Aitken (Weta model supervisor), Warren Mahy (Weta designer/sculptor), Bill Hunt (prosthetic makeup), Gino Acevdeo (Weta prosthetic supervisor), and Ngila Jackson (costume designer). One of the best parts of this piece is the test footage of Bruce Spence as the Mouth of Sauron, in which Jackson experiments with using a digitally enhanced vertical mouth. Creepy. David Wenham (Faramir), however, gets off the best line, commenting that he felt like the "Stay-Puft monster on top of a horse" in his armor. The costume design segment is pretty much what you would expect, with Ngila Dickson (costume designer) leading viewers through her various designs, fixating on Eowyn and Arwen's gowns, Pippin's Gondor uniform, and Merry's Rohan attire, as well as developing a "virile" look for Gandalf. This is fairly extensive collection of production sketches, broken down into three principal categories, with some images available with an optional artist commentary, as well as a slideshow option. The three sections are The Peoples of Middle-Earth, The Realms of Middle-Earth, and Miniatures (which uses a combination of sketches and production photos). This one surprised me, and turned out to be extremely enjoyable, considering I expected a half-hour docu on horse training to be a bit dull. It was, however, immensely entertaining, from Ian McKellen referring to his horse as a "diva" to the perils of rabbit holes to seeing some harrowing footage of a rider accidentally falling off his horse during a charge of 250 horses. Barrie Osbourne (producer), Rick Porras (co-producer), Graham Ware (horse trainer), Don Reynolds (horse trainer), Jane Abbott (rider double), and Geoff Murphy (second unit director) provide most of the details on the problems of getting horses to do what the director wants, and this piece includes some hilarious jokes about the sexual bump and grind required to ride the "fake horse" used for some shots. A huge map traces the journeys of either Frodo and Sam; Merry, Aragorn, Legolas and Gimli; or Gandalf and Pippin. You can click on a part of the journey, which pays off with a quick clip from the film. Very cool. Disc 3 wraps with New Zealand as Middle-Earth (16m:08s), a tour of the real New Zealand locales used for Middle-Earth hotspots East Ithilien, Dunharrow, Paths of the Dead, the Pelennor Fields, the Black Gate, and good ol' Mordor. The hobbits handle the Introduction (01m:40s) duties on the fourth disc, with Billy Boyd, Dominic Monaghan, and Elijah Wood providing directions on how to navigate about. Holy cow, as if by this point we haven't already been given just about every detail imaginable, here comes a 73-minute piece on shooting the trilogy, focusing largely on The Return of the King. Peter Jackson points out a scene between Sam and Frodo that featured an amalgam of footage shot a year apart, and Christopher Lee shatters movie magic by pointing out one of his pivotal Saruman sequences was "shot in a car park," and there is discussion of the originally trimmed Death of Saruman scene. Cameras in Middle-Earth is broken down into 11 major sections, covering various elements of production done for Isengard, Edoras, the Cross-Roads, Minas Tirith, Pelargir (including Jackson's cameo as a Corsair), Shelob's Lair, Pelennor Fields, the Black Gate, Mount Doom, the Shire and the Grey Havens, all leading to the final day of principal photography. You want a staggering amount of Production Photos, too? Good god, there's a bunch of 'em here, so dig in. It's all about the infrastructure, organization, and pipeline required to generate the 1488 effects shots needed, from developing the proper look of the clouds spreading out from Mordor to fine-tuning digital horses and riders needed to enhance the mumakil sequences during the Pelennor Fields battle. One of the participants refers to Jackson's ideas as "ridiculous stuff," but it's clear they all love it, and the eventual changes made from the initial mumakil animation to the final product is a real trip to watch. Featured participants are Peter Jackson, Jon Letteri (Weta visual effects), and Stephen Regelous (software developer) among countless others, and one of the gems here (aside from all that great mumakil footage) is a test clip of CG horses trampling a car on a desolate New Zealand road. Broken down into Pre-Viz, Environment, Live Action, Animation, Rough Composite, Final Film (all available with optional commentary from unnamed production personnel), this segment gives you more than you thought you wanted to know about how many separate elements are put together to create one of The Return of the Kings most impressive battle sequences. The underlying theme for this segment, according to producer Mark Ordesky, is the "torturous editing process" and features Jackson and longtime collaborator Jamie Selkirk (co-producer, editor) and the keynote surreal visual of Christopher Lee going through his lines, in full Saruman garb, wearing a pair of huge reading glasses. It's composer Howard Shore's turn in the spotlight here, as much bowing and praise is heaped upon him. Shore provides some obligatory comments on what certain passages are meant to instill in viewers, and, for the curious, even includes a clip of his cameo in the film. Music is one thing, but what's with all those sounds? you ask. The sound design team wrap microphones in condoms, drops two-ton concrete blocks, and pours walnuts and coconuts across concrete floors to find just the right audio nugget for everything from Shelob to a cascading pile of human skulls. Primary input comes from Chris Ward (ADR/recordist), Rosemary Dority (post-production supervisor), Ethan van Der Ryn (supervising sound editor), and David Farmer (sound designer). Rick Porras (co-producer,) Jamie Selkirk (co-producer, editor), and Annie Collins (editor) are among those who discuss the pressure-cooker world of the final edit stage of production. Putting the squeeze on composer Howard Shore, tightening up the already expansive story, and how edits affected everything from sounds to the ever-developing score is the centerpiece here, and it looks like it was a crazy, hair-pulling time for one and all. With the film done just a couple of days before its world premiere in Wellington, NZ this segment follows the unleashing of The Return of the King upon the world. One of the weirdest scenes features a showing of the film in a huge stadium, complete with hundred of actors putting on an elaborate stage show, after spending six months rehearsing key scenes from the previous two films. The final extra on this set is a deeply moving tribute to Cameron Duncan, a talented teenaged filmmaker from New Zealand who originally attracted the attention of Peter Jackson after he saw a number of his short films, and in the process recognized a bit of himself in Duncan's work. Duncan contracted a fatal form of cancer not long after their meeting, and this segment includes not only two of his films (the haunting DFK6409 and the softball-as-life-and-death beauty of Strike Zone), but his visits to the set of The Return of the King. His imminent death became an indirect inspiration for the closing song (Into the West), and by the time this segment concludes Peter Jackson was not the only misty-eyed one. This is a very touching feature of a very talented young filmmaker, and his message in DKF6409 is something we all should live by. DFK6409 (04m:38s) and Strike Zone (11m:16s) are also included as separate extras, and both are recommended viewing, even if you bypass the docu. Discs 3 and 4 feature a Play All option for the hours and hours of extras, so choose that and sit back. And if all the above isn't enough, there are two easter eggs, one featuring Dominic Monaghan goofing around with Elijah Wood (09m:00s), and a second one featuring a clip from the MTV Movie Awards (05m:50s), with Ben Stiller and Vince Vaughn pitching a fourth "sequel" to Peter Jackson. Silly, but funny. Disc 1 contains chapters 1-36, and runs 02h:07m:33s. Disc 2 concludes with chapters 37-78 (including Fan Club credits) and runs 02h:15m:25s. Optional English or Spanish subtitles are also available. This extended edition of the third film in The Lord of the Rings trilogy is a fitting final chapter to Peter Jackson's expansive epic. The extra fifty minutes of added footage, a mix of new and extended scenes that push this version well past the four-hour mark, are each important in their own way, especially if you fall in the "I can't get enough of this stuff" camp. As with the other extended editions in the trilogy, it is almost like seeing a completely different film. Then there's the extras—four commentaries featuring over 40 participants, plus hours and hours of detailed documentaries, production photos, sketches, and a couple of funny easter eggs. This is how special editions should be done. Certainly one of the year's most anticipated releases, it should be no surprise that this come highly recommended.